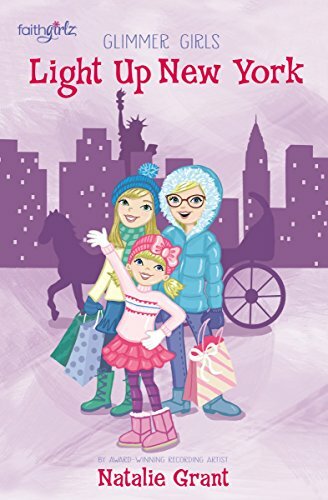 "Light Up New York" is the fourth book in the Faithgirlz Glimmer series. Twins Mia and Maddie, along with their little sister, Lulu travel around the country solving mysteries along finding new adventures. The Glimmer sisters travel with their famous singer mother, Gloria Glimmer, their father, and their information packed nanny, Miss Julia. Along the way, the sisters discover the true meaning of friends, family, telling the truth and forgiveness. In the latest book, the Glimmer family heads to NYC to perform a charity concert in Time Square where the whole family joins in the concert. However, right around the time of their visit, something mysterious happens that the whole family gets involved. Who is the Snow Angel? How would the girls learn sympathy? Each of the book in the series can be read as a standalone. I have not read any of the other books in the series. The novel is great for grade schoolers and tweens as it doesn't have any questionable content and it encourages children to kind, truthful and to think of others. The girls also have a healthy relationship with their parents with mutual respect, trust and love. I found the book to be a quick and easy read while being enjoyable. I thought it was a decent book but my younger female cousin enjoyed the book and wanted to read the rest of the series.